Attitude, Focus, Innovation, that was the themes for our second AFI annual conference held at the Belfry Hotel & Golf Resort in early September. The two-day event lived up to its promises to be another thought-provoking, informative and enjoyable event. We were honoured to have some of the leading experts within their respective fields from our industry joining us as our speakers for the day, sharing their knowledge, experience and insights. Our industry is constantly changing; some of the changes are a welcome development in technology, health, safety and welfare, whilst others are driven by political and legislative factors. We as a group, play a relatively small part of the construction landscape, but we hope, a critical part of the supply chain. The response to last year’s introductory conference, where we focused the conversation on safety when working at height, innovation and mental health issues within the construction industry, was better than we could ever have hoped for and has stimulated refreshing new dialogue about how we can improve processes in the construction sector and confront the coming challenges. Again, we tackled the issue of health as well as safety. Over 150 delegates heard from a line-up of engaging and thought leading speakers who didn’t just offer commentary on the issues being faced by the sector, but real insight into the steps needed to provide solutions and practical planning for its changing landscape. After registration and refreshments at the wonderful Belfry Hotel & Resort, the seminar started with a warm welcome and introduction from the host Brian Parker, AFI Business Development Manager (Technical Support) Grad IOSH MIIRSM. The evening event commenced with the delegates enjoying a turn on the golf simulator, fine dining and conversations with guest speaker Alastair Campbell. Many stayed and joined us for a competitive day on the world-famous Belfry Derby course. Under the leadership of Brad Boehler since 2011, SkyJack has aggressively expanded its business. While the company’s first products were scissor lifts, Brad has championed the objective of being a full line access and telehandler supplier. Brad spoke very honestly and openly about safety and accidents by taking us through a manufacturer’s history of incidents and industry improvements with real data from experience in the aerial work platform and rental business. Neil Doherty and Phillip Godding took the audience through a presentation on digital safety technology developments and BIM product development, highlighting shifts in attitude that they are experiencing. He demonstrated JLG’s innovations in safety technology by combining a simulation of a building with mobile technology to apply Augmented Reality (AR) for site-based risk assessments and other safety initiatives. AFI’s Paul Maxwell talked to delegates about AFI’s latest ideas and developments in innovation and safety and how AFI have worked with award-winning designers and manufacturers to develop the CatchZone Safety Innovation. 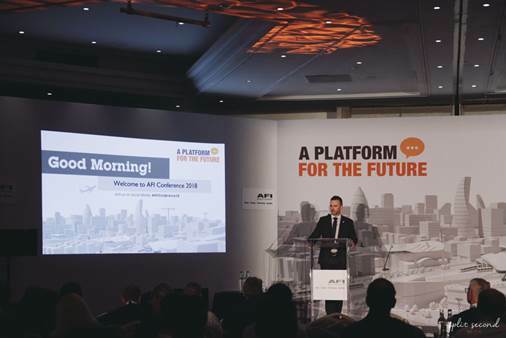 Andrew presented on IPAF’s latest safety campaign ‘Plan Ahead’ which highlights the main contributing factors to falls from the MEWP platform and how these can be avoided to ensure all those working with MEWPs plan for safety from the ground before work starts. Andrew told us that improving safety and engaging the workforce through planning to prevent accidents has led to a move in the UK towards the first zero aerial lift fatalities year in 2018.
construction forecasting. His presentation provided a fresh perspective and a positive business and economic outlook for the sector, with an interesting exercise on the collective uncertainty that we are experiencing, by using examples of ‘Myth v Reality’ from UK Media. was Martin Coyd, OBE from Mace Construction. Martin delivered an engaging and entertaining but thought-provoking presentation for the second year running on mental health in the workplace. He outlined the fact that although mental health awareness within the sector has improved dramatically in the last 12 months, over 400 construction workers still take their own lives each year. He identified the need to educate at all levels within the organisation to adopt positive coping strategies and identify stress triggers, then provide clear pathways to help and support. Next up, Dylan Skelhorn shared his poignant and personal story about how in 2011 he fell 10 metres from a roof and ladder landing on a brick wall and sustaining severe multiple injuries. The completely avoidable accident changed his life and led to serious mental health challenges. His story is a harsh reminder to us all at every level that unfortunately, these incidents are still happening today. Rob was diagnosed with bipolar disorder in 2002. He talked to us about his own personal struggles coping with depression, how to become resilient and how mental health is one of the greatest causes of sickness absence in the UK. He then spoke about the ‘ripple effect’ caused by more and more people in the workplace acknowledging the issues and slowly smashing the stigma of mental ill-health in the workplace. Mark’s presentation, called ‘Rest and Recovery and why polar bears don’t do yoga’, was both engaging and informative. He took us through developing a resilience strategy by understanding the body’s nervous system, how rest and recovery was as important as the flight or fight response, and how difficult it can be to separate mental and physical symptoms. The afternoon started with an enlightening presentation by David White on how to create a bespoke mental health framework for your company, using his own organisation’s experiences. He talked about how the Galliford Try team have overcome barriers, measured successes, learned lessons and engaged their workforce by developing an award-winning mental health framework which has resulted in a staggering reduction of 7,700 sickness days in just nine months. point in terms of people’s greater understanding and society’s greater openness about mental illness.” Alastair saved his planned speech on Brexit and the rationale for a second referendum for after the evening dinner and delivered a thoroughly controversial yet, thought-provoking close to the AFI Conference 2018 event. Examples of innovation on show at the conference included a virtual reality simulator and our CatchZone safety innovation, an accessory designed to prevent tools, equipment, and other work related items being dropped from Scissor Lifts. Special thanks to our gold sponsors - SkyJack and JLG & silver sponsors – Sterling, Dingli, Platinum, Genie, Trackunit & Haulotte.